The Rejuve! system works by forming an artificial barrier to sweating then forcing the body to perspire through it. Proprietary Rejuve! creams create a “second skin” barrier, while a cocoon-like infrared heated blanket heats your entire body up to 55 degrees Celsius, forcing the body to sweat through the “second skin” barrier. 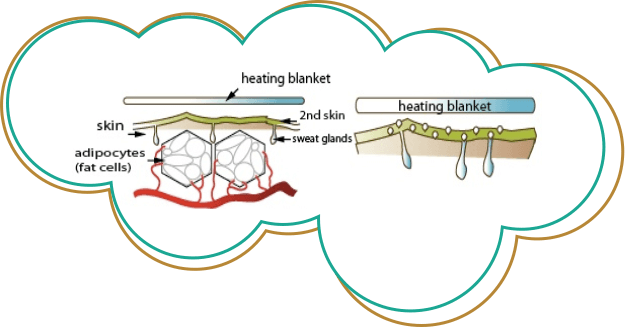 As body temperature increases, the “second skin” barrier makes it much more difficult for the body to perspire, requiring more energy (calories) to force the perspiration through the sweat glands in the skin (and through the barrier). 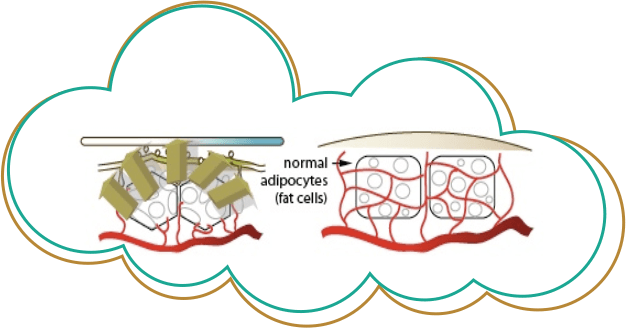 With increasing temperature, the body begins to release fat from the adipocytes (fat cells) and excretes waste through your perspiration. The deep cleansing effect of the Rejuve! treatment is the reason that weight loss occurs. Fat becomes water-soluble at 43 degrees Celsius and thus can be expelled through the pores. The result is that in just one session at Rejuve! you will slim down and as an added bonus – alleviate stress. * Results may vary.